During the visit to San Francisco, on the occasion of opening a voting place in California, Acting Consul General Dejan Radulovic had many meetings and conversations with the representatives and individuals from the Serbian community in San Francisco and surrounding area. 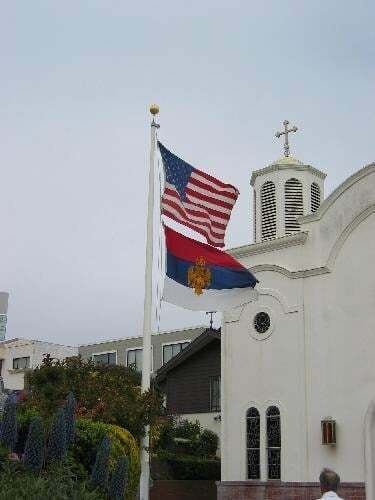 Acting Consul General Radulovic visited church school districts of the orthodox churches St. Archangel Michael in Saratoga and St. John the Baptist in San Francisco. During those visits he spoke with the priests and representatives of those church school districts about the questions regarding the interest and importance of the activities pertaining to the preservation of Serbian community, as well as cooperation with the Consulate General. He also attended the morning liturgy at the church in San Francisco followed by a meeting at the church hall with our citizens where he responded to their questions. Acting Consul General Radulovic attended the gathering of Club Tesla which works at the Serbian Orthodox church in Saratoga. During the visit he addressed attendees and spoke about the role and activities of the Consulate General. He responded to the questions from the audience which mostly referred to the status of the citizens as well as to the support of the Consulate General in the educational and cultural activities of the club.